Delphinus, the Dolphin, is a sea creature constellation with some strangely named stars making up its central star pattern. The constellation is visible in the August night sky. One of the smallest constellations is reaching its highest point in the sky at around midnight local time this week, and the stars it contains have some unexpected names. The constellation Delphinus the Dolphin attracted the attention of ancient watchers of the sky because, even though it is tiny and consists of only faint stars, the stars are so closely spaced that they are easily seen on dark, clear nights. 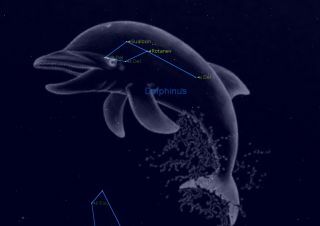 This sky map of the Delphinus constellation shows the location of the cosmic Dolphin in the late August sky, while looking southeast at 9 p.m. local time from mid-northern latitudes. Some reference books refer to the diamond as "Job's Coffin," though the origin of this name is unknown. Two stars in the Delphinus diamond have rather odd names: Sualocin (Alpha Delphini) and Rotanev (Beta Delphini). They first appeared in the Palermo Star Catalogue in 1814, but nobody seemed to have a clue as to their origin. The English astronomer Thomas William Webb finally solved the mystery by reversing their letters, revealing the name of Nicolaus Venator, the Latinized form of Niccolo Cacciatore, the valued assistant and eventual successor of Palermo Observatory Director Giuseppe Piazzi. But to this day, nobody knows for sure whether it was Piazzi or Cacciatore himself who ultimately named these two stars. During the 1960s and '70s, one of the most popular people ever to lecture at New York's Hayden Planetarium was Fred Hess, who was known as the "evangelist of astronomy" and the dean of New York amateur stargazers. He was the instructor of astronomy and navigation at the Hayden Planetarium, but he was well versed in all aspects of science. Whenever Hess gave a tour of the summer night sky, he would entertain his audiences by telling the story of Sualocin and Rotanev. Then, he would embellish the tale by stating that he was always jealous of Cacciatore and decided on his own — in tongue-in-cheek fashion — to name the two other stars in the Delphinus diamond. For the star Gamma Delphini, he assigned the name "Derf," which is "Fred" spelled backward. And since a well-known astrophotographer in those days, Robert Little, was one of his best friends, Hess referred to the star formally known as Eta Delphini as "Bob." Of course, the Derf and Bob monikers rarely got far beyond the confines of the Hayden Planetarium. But it was a much different story in the late 1960s when, during NASA's Apollo program, three reversed names that started out as a prank were unknowingly assigned to three stars. The Apollo spacecraft that took men to the moon were designed to operate under inertial guidance, with gyroscopes keeping them pointed in the right direction. But because the gyroscopes tended to drift, the Apollo astronauts had to periodically recalibrate the system by using the positions of known stars. Astronauts Virgil (Gus) Grissom, Roger Chaffee and Edward White were expected to be aboard the first Apollo flight. While training in celestial navigation however, Grissom, as a practical joke, quietly incorporated three new names onto NASA's star list: Dnoces (which was really Iota Ursae Majoris, or Talitha), Navi (Epsilon Cassiopeiae) and Regor (Gamma Velorum, or Suhail). In later missions, these three maverick stars were accorded the same respect as celebrated ones like Sirius, Vega and Aldebaran. They even turned up on some star maps that were published during the late 1960s and 1970s. As it turns out, Dnoces is the word "second" spelled backward, a reference to the ordinal number often appended to White's name (Edward White II). Navi was Grissom's middle name (Ivan) spelled backward and Regor was Chaffee's first name (Roger) in reverse. Today, the names are classified by most reference sources as "disused or never really used." Grissom had no idea that his celestial jest would turn into a memorial to himself and his crewmates. All three perished in a fire that enveloped the Apollo command module on Jan. 27, 1967.